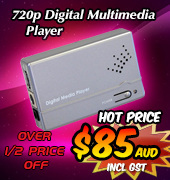 High Definition Component to 1080p HDMI Scaler Box is our newest Digital Video upscaler. Designed to upscale digital video signals from a High Definition Component source, such as Blu Ray players and Gaming Consoles, to digital HDMI output of High Definition and PC resolutions. This product scales any High Definition resolution to other HD resolutions of 480p/i to 1080p/i, or PC resolutions from VGA to WUXGA. 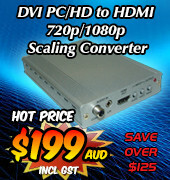 Ideal for displaying your Component Y/PbPr/CbCr video signals onto your HDTV or PC monitor. When first connected to your HDTV or PC monitor, the default "Native" setting of the Scaler Box auto-detects the connected display device and outputs the best corresponding resolution and refresh rate. Once displaying, you may change the output to suit your requirements. 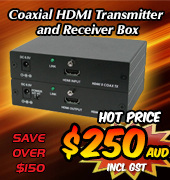 The HD to HDMI 1080p Scaler Box also accepts stereo LPCM digital and analog Audio signals and converts them to stereo LPCM digital or analog output for connection to your Home Theatre System or TV/Monitor speakers. Simple OSD menu control for audio input source selection and the output is to HDMI, TOSlink(optic fibre) and phone jack, all at the same time. A comprehensive OSD Menu gives the User full control over the output HDMI signal. Not only can you change the output resolutions, you also can control standard functions for Brightness, Contrast, Colour, Finetune, Size (Full/Letterbox/Panscan/Overscan/Underscan) and Audio input. If you have any problem when changing output resolutions, then a simple procedure allows the HD to HDMI 1080p Scaler Box to be easily reset to factory defaults. Fully HDMI 1.2, HDCP 1.1 and DVI 1.0 compliant. If you wish to see and read more about this new product, then please click here for access to the product webpage. Full specifications, features and a free downloadable User Manual are available here. For any assistance with the product, please contact our friendly Sales Staff by phone on +61 2 49 689313 or by email at .